Fall and winter are the recommended times for planting most trees and shrubs, but palms are an exception. Because warm soils are favorable for palm root growth, between May and September is the recommended time for planting palms. There are several things to consider when deciding what type of palm to plant. Maybe the most obvious consideration is whether or not the palm is cold hardy enough for this area. This past winter was a good test of what palm species are cold hardy enough for this area. It showed that we can’t count on growing species like queen palm in the long term. Another consideration is our soil conditions. There are not many places in Livingston Parish that have really well-drained soil. The petticoat palm (Washingtonia filifera), for example, is native to dry areas of California and Mexico. I would be hesitant to plant something like this in Livingston Parish. Besides tolerance of our temperatures and soil conditions, disease resistance of palms is important. Within the past several years, a couple of palm-killing diseases have been found in Louisiana for the first time. Date palm lethal decline (also known as Texas Phoenix palm decline) has killed a number of Canary Island palms in the New Orleans area. 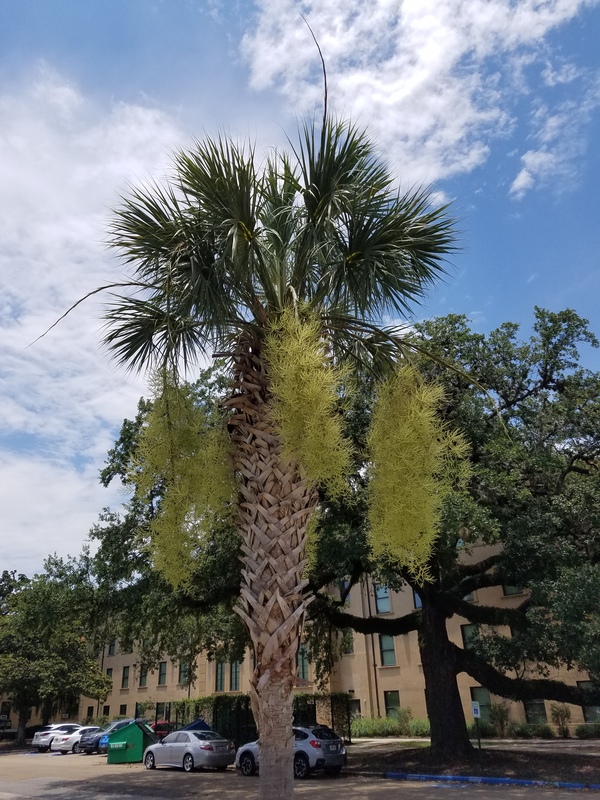 Chinese windmill palm is a palm species that is common in this area and is relatively cold tolerant, but date palm lethal decline and a similar disease, lethal yellowing, were found in dying Chinese windmill palms in Baton Rouge last year. Other palm species affected by these diseases include the edible date palm and the silver date palm (sometimes called the Sylvester palm). Considering all of these things, two palm species that I think are among the better choices for our area are the cabbage palm (Sabal palmetto) and the pindo palm (Butia odorata or B. capitata; also known as the jelly palm). The cabbage palm is native to the southeastern United States and is relatively tolerant of a wide range of soil conditions. It is cold hardy to at least USDA Hardiness Zone 8b, so should be fine, temperature-wise, for all of Livingston Parish. While cabbage palm can get date palm lethal decline, it doesn’t seem to be as severely affected as some other palms are. The cabbage palm has palmate (hand-like) leaves, like those of the Chinese windmill palm. The pindo palm has pinnate leaves – like those of the coconut palm, edible date palm, etc. – so people who are looking for a more tropical look may prefer this one. It’s more cold hardy than the mule palm (a cross between pindo and queen palms) and, unlike mule palms, does not get the disease Fusarium wilt. Like the cabbage palm, it is cold hardy enough for any part of Livingston Parish. You might notice that I haven’t mentioned the sago palm. This “palm” isn’t actually a member of the palm family but is what’s known as a cycad. While most sago palms experienced cold injury this past winter, most of the ones I’ve seen seem to be re-growing. They will likely come back from the roots after a cold winter, even if the top part is killed.